Get Tiger Fans into the game! Team mascots get the crowd going and help the team get the win. Ideal for sporting events, school games, pep rallies, parades, charity activities, and more.This costume includes the head piece, the body suit, the gloves, and the shoes. And each part is separated. The high visibility and flexibility of this costume will ensure your comfort and convenience when you are wearing it. Please read at least three times before cleaning, make sure you know whether your costume is fur or foam. Fur Costumes: Dry-clean, hand wash or use large front loading commercial machine. Use cold water and mild detergent. Hang dry, DO NOT use heat to dry! ONE SIZE FITS MOST Adults 5'3"(160cm) to 6'0"(180cm) tall and under 200 lbs weight. If you need larger or smaller size, please send us your height and weight, then we can custome it for you ! 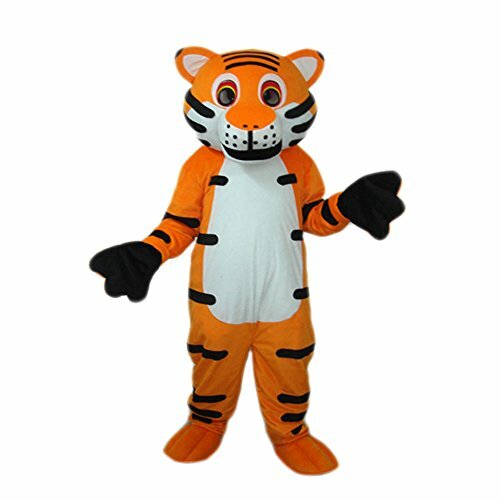 TIGER COSTUME Adult comes complete with handmade oversized mascot head, plush body, the gloves,the shoes and the cooling fan. APPLICATIONS: Mascot costumes can be used by Schools, Sports Team, Entertainers, Theme Parks, Exhibitions, Pedestrian Streets, Church Organizations, Product Promotions, Openings, Wedding Ceremonies and Public Benefit Events etc. COOLING FAN DESIGN: There is a ventilative cooling fan installed inside the headpiece of the Foam mold version mascot costume to improve the comfort of the wearer during their performing. QUALITY GUARANTEE:We are mascot costume factory,All of our mascot costumes owns high quality,you will get what just like the photos.If you have any problems, please contact us free. We must help you and find a best solution for you. If you have any questions about this product by MascotShows, contact us by completing and submitting the form below. If you are looking for a specif part number, please include it with your message.